Foamy meringue makes a delicate, slightly chewy topping for pies, adds a light airiness to cakes, and makes crisp, foamy cookies. Though it’s a delicate process with a large margin for error, meringue making still proves to be fairly simple after you've had some practice. You create meringue by infusing air into egg whites to make them expand up to eight times their original volume, then adding a stabilizer to maintain the foam. Meringue forms best with 1-week-old eggs set out at room temperature for at least 30 minutes before whipping. Sugar draws moisture out of the egg whites, helping to stiffen the meringue. The hardness of the meringue increases with the amount of sugar. Use super-fine granulated sugar or powdered sugar that dissolves quickly in the egg whites. Vanilla is not required but sometimes used to flavor meringue. Stabilizer options include cream of tartar, lemon juice and vinegar, used in small amounts -- roughly 1 teaspoon for every 3 large egg whites. These acids reduce the pH in the egg whites' albumen, making it easier for the foam to hold shape. If you are using a copper bowl, you won't need a stabilizer, as the egg whites take up metals that stabilize the foam. Italian, French and Swiss are the three main meringue variations, each classified according to hardness and each with different uses. 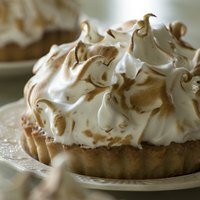 Italian meringue, a soft variation, forms the pillowy topping common on baked Alaska ice cream dessert and lemon meringue pie. Italian meringue is made with hot sugar syrup --equal parts sugar and water -- and requires about 2 tablespoons of sugar for each egg white. French meringue, made with 3 tablespoons of sugar per egg white, is the hard meringue you might recognize as mushrooms for Yule log cakes and French macaroon cookies. French meringue is made cold, meaning sugar granules are mixed into egg whites. Swiss meringue, another hard meringue, requires the same amount of sugar as French meringue, but the egg whites and sugar are cooked over a double boiler to a temperature of 140 degrees Fahrenheit. You need copper, stainless steel, ceramic or glass bowls to make meringue because plastic bowls can contain trace grease that makes it difficult to form meringue, while aluminum bowls can turn the meringue gray. Add the egg whites, cream of tartar, if needed, and vanilla to the bowl. Beat the egg whites starting at medium speed, working your way up to medium-high speed until soft peaks form -- when you lift the beaters away, the meringue should lift straight up and curl over. Mix in the sugar about 1 tablespoon at a time to ensure the sugar is well incorporated only after the foam forms soft peaks or quadruples in volume. As you mix, gradually increase the speed up to high speed and continue beating until you achieve the desired stiffness for your meringue. The main trouble with meringue comes from adding the sugar at the wrong time. Sugar makes it more difficult for egg whites to form foam, so it must be added after the foam has already developed. Add the sugar at soft peak stage for soft meringue you intend to fold into a cake or use to top a pie. Hard meringue for cookies or used to layer a cake works best when the sugar is added at medium peak or firm peak stage when the meringue holds its shape fairly well. Mix until the sugar is completely dissolved or you'll have problems with grittiness and beading. Weeping occurs in Italian meringue if the sugar syrup isn't heated fully to soft ball stage, 148 F.